AUTHOR Chris Tew with input from Margaret and Gil Cochrane. Margaret Cochrane received a Kidney Transplant 40 years ago in April 1976. Margaret has definitely ‘Made The Most of Life’ and is great example of life after a transplant. She participated in the very first Australian Transplant Games in Melbourne, 1988, in the Women’s Tennis winning Bronze in the Singles and Gold in the Doubles. She has participated in numerous games since (Toowoomba, Bathurst, Shepparton, Adelaide, Wollongong …) and was a spectator at the last Australian Games in Melbourne, 2014. Marg is also a talented Table Tennis player and has won medals in that event too. Margaret has also been to the World Transplant Games as a Tennis player. 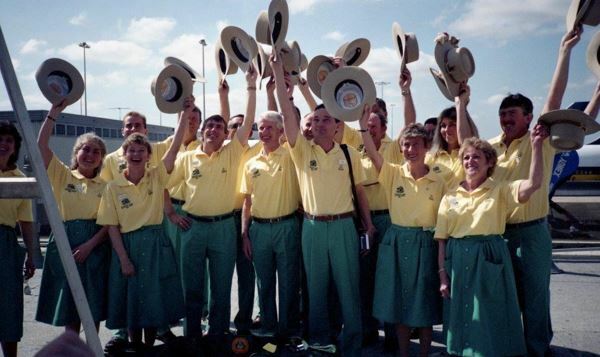 She can be seen with other Team members waving her hat in Singapore (Front left), she won a Gold Medal in Doubles Tennis. Other World Games include Vancouver, winning a Silver medal in the Tennis Singles. Margaret and husband Gil have promoted Organ and Tissue Donation in the community – especially country areas, for most of the 40 years. Both are seen in the insert at a Transplant Victoria dinner. Marg was one of the Transplant Recipients who rode their bikes from Launceston to Hobart to raise awareness of Organ and Tissue Donation. Margaret and her family are very grateful to her kidney donor and her donor’s family for the gift that has allowed her to see her children grow up, grandchildren arrive, live an enjoyable and productive life for an amazing 40 years.